CENTENNIAL, CO, November 5, 2015	(Newswire.com) - SchoolSAFE Communications will provide school safety training to help bring an initial 14,000 schools under the protection of the National Emergency Communications Plan, the company announced today. SchoolSAFE Communications has developed a system and training methods to leverage what the nation has already invested in communications infrastructure with an upgrade that would expand public safety interoperable communications to include all schools nationwide. The communications training is designed to meet the needs of early adopter states such as Colorado and New Jersey that have formally established the viability of direct emergency radio communications between schools and first responders during school incidents. At the local level, SchoolSAFE also provides training and mentoring to counties and school districts that are ready to merge their communications systems during a crisis to better coordinate their emergency response. The national infrastructure upgrade solution was developed and tested over a period of 8 years, and patented by Colorado-based SchoolSAFE Communications. The company's pilot programs currently protect one in seven high school students across Colorado. According to SchoolSAFE president and inventor Patrick Hobby, SchoolSAFE first solved the technical issues that had previously blocked school two-way radios from talking with the advanced radios favored by first responders. SchoolSAFE technology allowed schools for the first time to plug into the nation's public safety communications networks. SchoolSAFE then aligned its school safety solution with all components of the National Emergency Communications Plan (NECP), the National Incident Management System (NIMS), the Incident Command System (ICS), the National Infrastructure Protection Plan (NIPP), and the Colorado Safe Schools Act. Multi-agency training for the SchoolSAFE Communications solution is also integrated with the "Guide for Developing High-Quality School Emergency Operations Plans," jointly developed by the U.S. Department of Education, the U.S. Department of Health and Human Services, the U.S. Department of Homeland Security, the U.S. Department of Justice, the Federal Bureau of Investigation, and the Federal Emergency Management Agency. To support ongoing research and development, SchoolSAFE has established in Colorado a National School Safety Center of Excellence in cooperation with the Pueblo County Sheriff's Office, Pueblo County School District 70, and advocacy group School Safety Partners. The Center of Excellence conducts monthly full-scale exercises to test the SchoolSAFE system in a variety of scenarios, and develops system improvements such as custom applications for school stadiums, portable classrooms, school buses, and mobile command centers. 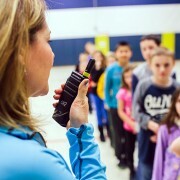 SchoolSAFE Communications offers a solution that makes it possible for school-based radio systems to connect directly and securely with the radios used by first responders. Now, with just the push of a button, school personnel are instantly connected to community police, fire, EMS and 9-1-1 call centers for reliable, secure, two-way communication during a crisis. For more information, visit SchoolSAFE Communications at http://schoolsafecom.org.